Actor #Irrfan_Khan has been roped in to star in Hollywood film #Puzzle by New York-based Big Beach Films, known for producing the Oscar winning "Little Miss Sunshine". He is looking forward to it. The film will be helmed by Big Beach's co-partner Marc Turtletaub. It is an adaptation of the Argentine film "Rompecabezas", which came out in 2010. 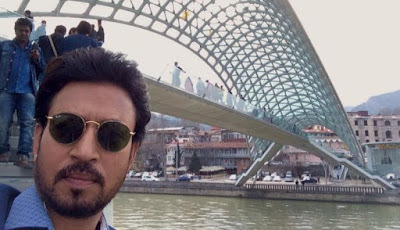 Irrfan said in a statement: "I'm really looking forward to working with the team who have been associated with great films like 'Little Miss Sunshine', 'Loving' and many more." The film tells the tale of a 40-something woman who is consumed with caring for the men in her family. When she discovers she has a gift for assembling puzzles, her world begins to open and her entire family is forced to adjust and grow as well. Irrfan, who starred in Ron Howard's 2016 film "Inferno", will soon leave for New York to begin work on the project in which he essays the lead alongside actress Kelly Macdonald. "My co-actors have an incredible array of work and I'm happy to soon be working with someone as talented as Kelly Macdonald. We will begin work in June," he said.